Understanding everything that is happening in the state of Oaxaca is not easy, and as a Oaxacan who resides in California, it is very sad seeing the conflict between the government and the members of the Coordinadora Nacional de Trabajadores de la Educación (CNTE). More than three weeks have passed since Federal Police in Nochixtlán, Oaxaca shot at protesters with automatic rifles, launched tear gas and even deployed a helicopter to fire into a conflict zone. The protesters didn’t have any other option but to defend themselves from the attacks with rocks and sticks. 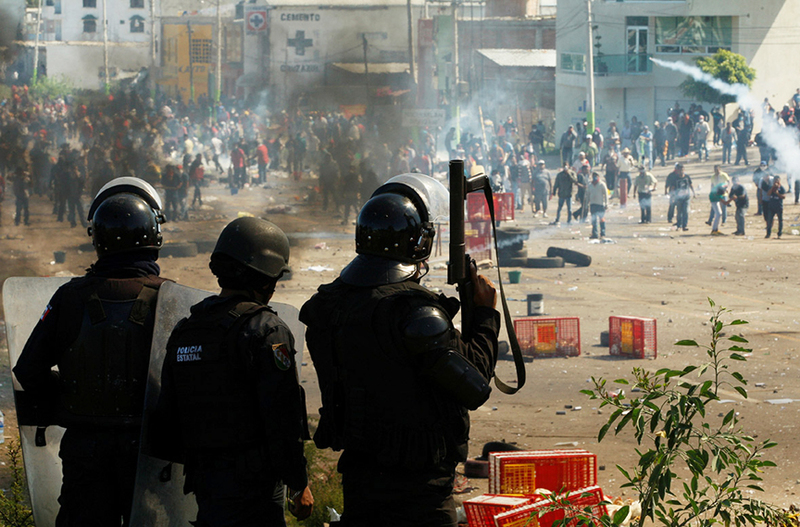 The violence left at least six protesters dead and dozens injured. This harassment and repression was experienced in different parts of Oaxaca, where the government allegedly cut electricity and telephone service in several neighborhoods. Even though several weeks have passed, road blockades and protests in support of the teachers continue in Oaxaca and other states in Mexico. Unfortunately, the international and domestic press has not given much airtime. President Enrique Peña Nieto has not said much, and neither have presidents from nearby countries. It seems it is more important for these presidents to speak of commerce than to discuss the loss of human lives. Today, most Mexicans expatriates stay informed through social networks and our relatives. To help me understand more about this conflict, I spoke with professor Heleodoro Pérez, my uncle who lives in Oaxaca and has participated in the protests. “These protests are not only against the education reform, but are a struggle against the structural reforms that were approved in Mexico,” he said, adding that these reforms include policies that will endanger human rights and the country’s natural resources. The education reforms will implement teacher evaluations, which will use a standardized exam to “assess” the academic level of the teachers. Teachers who do not pass will be fired, without given the opportunities or support required so they can continue preparing themselves for their profession. It’s important to mention that a standardized exam cannot measure the passion and dedication of a teacher’s instruction. This passion for teaching is very important, as many teachers have to travel to reach remote places such as indigenous communities where their students live. A teacher who teaches in an urban zone can’t be compared to one who teaches in a disadvantaged or indigenous community, where in many cases, the necessary resources to implement an adequate education are lacking. The same is true for standardized exams. This “education reform” is more about labor reform than education, as it will not change any academic material In fact, it will put labor rights at risk, and will cause many unjustified terminations. This will not only affect teachers, but students and their parents, who may begin to consider a private education. This will result in parents having to pay for books, electricity services, drinking water, etc. Students in rural communities that live in extreme poverty will not be able to continue their studies due to a lack of economic resources. Education in Mexico could become a privilege and not a human right. If the Mexican government insists on implementing these evaluations on teachers, it would be a good idea to demand evaluations on the politicians themselves, to measure the level of their corruption and to see if they are qualified to lead our country. What Mexico’s president must do is visit schools in these rural zones and see if they are in proper condition. We are in agreement that there must be a change in education, but it must start with ending the socioeconomic inequality that exists in the country that prevents many children and young people from attending schools. It is necessary to address the root of this educational problem and stop thinking that “fixing” the surface issue will resolve the true problem. The teachers only ask for an open dialogue with the government to discuss the structural reforms that affect the Mexican people. The government violence and repression against the protesters is not acceptable and will only create a climate of confrontation. The Mexican people will awaken little by little and the teachers of the CNTE are no longer alone in this struggle. Social organizations, students, parents, the health sector and others, have brought their support to the teachers and have joined them in demanding justice. Mexicans who live abroad must consider joining in solidarity with these teachers and not judging them without understanding what they stand for. The union of the people is the force that will fight social injustice.